After the Restoration of the Scottish Catholic Hierarchy in March 1878, there were only 5 parishes serving the City of Edinburgh; St Mary's Cathedral, St Patrick's Cowgate, Sacred Heart Lauriston, St John the Evangelist in Portobello and St Mary Star of the Sea in Leith. In 1890, St Cuthbert's Church, Slateford was opened for Divine worship- twenty-two years after the restoration of the Hierarchy. For the first quarter of the twentieth century, it served the west side of the city, including Craiglockhart, Juniper Green and Colinton on one side, and St Andrew's and Corstorphine on the other. At that time, there was a spreading of the population from the inner city to the west. The Corporation had already developed Stenhouse as far as the prison governer's house, and Hutchison as far as Longstone. The farm; and between that and the railway to the north, was bought for development in housing, and let out to rent by Gumley and Davidson. When Edinburgh Corporation developed Broomhouse as a housing estate, to ease the crowding of the inner-city, the Catholic population began to complain about the distance they had to walk- this being long before the days of the family car and frequent bus service. For most Catholics, it meant a walk of three or four miles- fine on a lovely summer's day, but not so good in cold, snow and ice. When an "estate" of prefabs was built just above Sighthill to the canal, it was just too far. The care of St Cuthbert's had been in the hands of Canon Forsyth and his Curate Fr Kieran Joyce, whose life's work had been extending the parish and certainly not chopping bits off it. 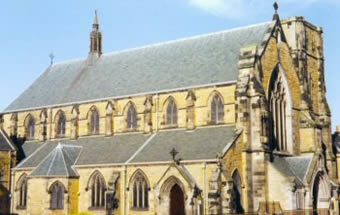 By 1938, there were four curates and Dr Peter Connolly was appointed parish priest when Canon Forsyth retired. It was now realised that the parish was too big, and that a new church would have to be built to the west, beyond Longstone, but, being wartime, building was strictly limited and a new church would have to remain a pipe-dream for the foreseeable future. The site for the future church was discussed by the appropriate committee and clergy, and it was reported that the corner of the Calder Road and North Saughton Road- now Whinpark Medical Centre- should be reserved for that purpose. However, this obviously did not come off in the end. 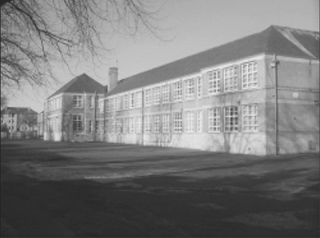 In the meantime, it was arranged that Murrayburn School hall should be hired and that mass would be offered there on Sundays for the people of Parkhead, Sighthill, Broomhouse and the Calder prefabs, from 1946. The four curates came from St Cuthbert's on a rota basis from May 1942 to 1950. ​There was a real sense of community. The people themselves created the atmosphere of prayer, worship and reverence. It was always a friendly and happy gathering. At one time, the congregation included German prisoners of war from the camp at East Calder. Although the fuss of Christmas carols wasn't appreciated by all, their rendition of Silent Night, in German, was a very moving experience from everyone in the congregation. There was a great atmposphere of hope and expectancy, as people worked and prepared for a "proper church". One fundraising venture was the weekly outdoor collection. The people of Parkhead and Sighthill contributed one shilling per week to the Building Fund. But the key question remained- where was this new church going to be? The decision to build on the corner of Calder Road was rescinded, - wait for it, - as Traffic Control may find it difficult to cope with large congregations decanting onto two main roads! Another site would be chosen, but due to wartime restrictions, the building of the church would be postponed and a temporary hall would be constructed on the plot set aside. But where? During this time, Dr Connolly had drafted some parishioners in to form the nucleus of a St Vincent de Paul Society and a Women's Guild to help raise funds. It took a friendly phone call to one of the fundraisers for him to learn that the walls of the new church were half-way up, and work was going well! A few of the men went down to investigate and were horrified at the location. The new church was almost in Corstorphine and as far away from Parkhead as St Cuthbert's was! However, they made up a treasure box containing religious artefacts, and buried the box underneath the spot where the altar was to be. Having answered the question where the church would be, now another question - until now left unanswered - why was it located on that site? An interesting entry in the history of St Nicholas Church, Sighthill 1939-64: "It was evident from those plans that the site - Broomhouse Place North - for the Church would be very far from the centre and so negotiations were entered into with officials of the Town Council for a new site." Could this solve the mystery as to how St Joseph's suddenly appeared? Such were the growing pains, but with Fr Henery as curate-in-charge, on his bicycle, a happy and reasonably prosperous parish was ready to take over on the official opening day. The parish was opened for worship on Easter Sunday 1950, ready to serve and worship the Lord in the new home they had provided for him.